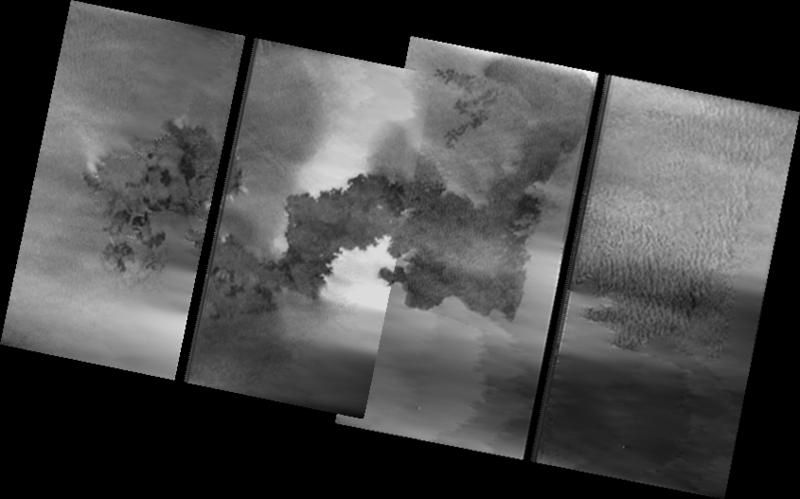 Today I got around to working on three more mosaics from Galileo I24 flyby. Like many of the mosaics from this encounter, none of these were released as complete mosaics by the Galileo project. These newly processed mosaics include: 24ISPROMTH02, a two-frame mosaic over Prometheus; 24ISTERMAP01, a six-frame mosaic covering terrain along the terminator; and 24ISSTEREO01 (left), a 12-frame nearly full-disk mosaic. With these done, I have two more observations to finish up with. I hope to have those done tomorrow or Monday. 24ISPROMTH02 covers the entire Prometheus flow field as well as Prometheus Patera, a volcanic depression at the northeastern end of the flow field. The images in this observation suffer from more gradient issues and other problems than most other images, but some details can be seen in the western part of the flow field and in the low mesa to the east. 24ISTERMAP01 is a six-frame north-south strip of images along 90° West Longitude near the terminator. This mosaic covers Hi'iaka Montes near the top of mosaic, as the sun sets on those mountains, the eastern parts of Itzamna Patera, and all the way south to Ekhi Patera. Again, the quality of the reconstructed summed images is not as good as some of the earlier observations, but topography at the margins of the paterae and lineaments in this region is visible as well as hints at some of the bright flows seen in earlier views of this region. 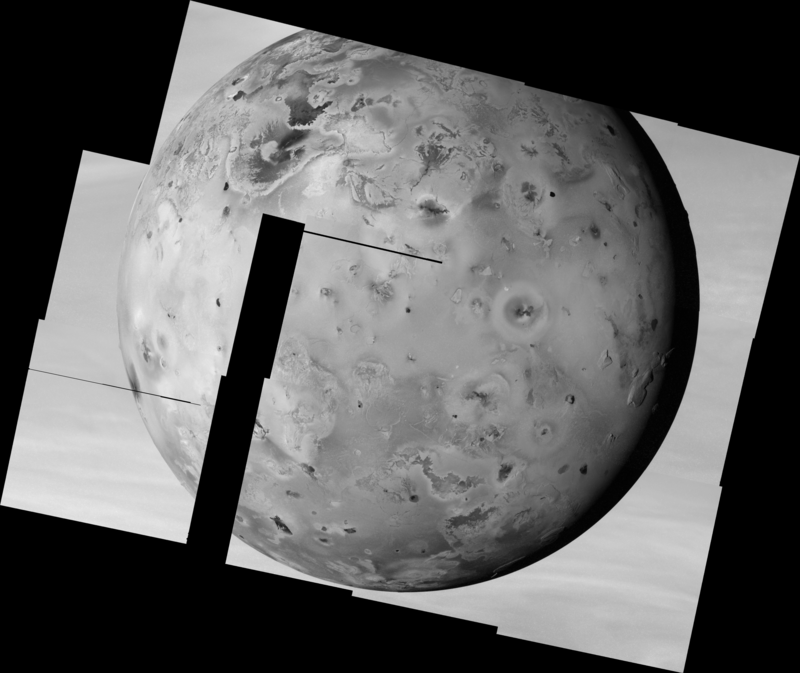 Keep in mind that in addition to being near the terminator (thus accentuating topography rather than albedo features), these images are also near the limb, so the features here are foreshortened. Ekhi Patera is actually pretty close to circular in shape. The pixel scale here is 540 m/pixel. 24ISSTEREO01 is a 12-frame mosaic covering much of anti-Jovian hemisphere of Io at 1.45 km/pixel, with Jupiter providing a nice background. A smaller version of the mosaic can be seen at the top of this post. Unlike the other mosaics from the I24 flyby, these images were acquired in full-frame mode. Images acquired in that mode did not suffer from the scrambling inflicted on the summation mode images during I24. This mosaic was designed as part of a stereo pair along with a similar mosaic acquired during C21 in July 1999. The relatively blandness of much of the terrain outside Io's mountains and volcanoes, plus the unusual phase functions of many of its surface materials complicate the develop of Digital Elevation Models from these two data sets. 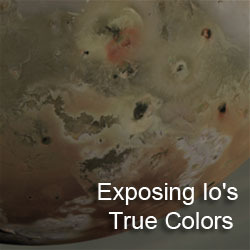 24ISSTEREO01 covers much of the same terrain seen in the full-disk color mosaic from C21, but Io is rotated about 40 degrees to the west, allowing for terrain between 220° and 260° West Longitude to be become visible. 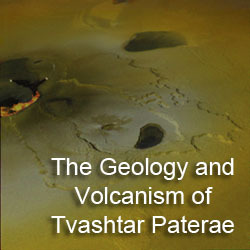 This includes prominent volcanoes such as Pele (near lower left), Pillan (to the north east of Pele), and Isum (near upper left). Also the higher phase angle makes it easier to spot topography, particularly along the terminator near 110° West. 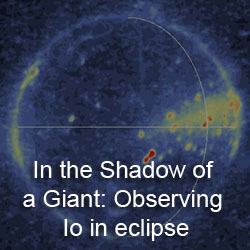 Mountains such as Gish Bar Mons, Egypt Mons, and Boosaule Montes can also be seen along the limb against the disk of Jupiter. The mitten-shaped plateau at right near the terminator is named Capaneus Mensa. Anyways, so I have 2 more to go.